is a sidewalk and on the other side of the tree is the street. Unless you've been living under a rock, you know that we in New England just got walloped with a huge snowstorm. My town got 38 inches of snow in one day and at one point supposedly snow was falling at 6 inches per hour. 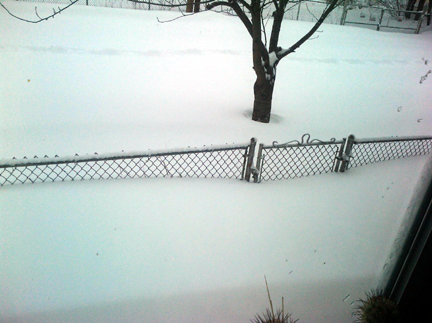 Lotta snow. If you want to watch it in action, there is an awesome video (less than a minute) in time-lapse. So you can imagine what it was like to shovel out of this insane mess, even with a snowblower. After 3 days, I finally got my car out. I called my cousin and said "I'm venturing out, does your mom need anything?" The reply was "well she's not shoveled out so she wouldn't be able to get anything you brought." Okay. I called my own mom who said she was going to walk to Wal-mart to buy dog food. I told her no, that I would buy it and bring it. But her street wasn't plowed yet (cul-de-sac) and neither was the street leading to it. I convinced her that the dog could survive on just dry food for a few days and set off on my own adventures. Of course who do I see wandering down the street on foot, clutching a bag of dog food? MY MOM! I get her into my SUV and get her as close to home as I could (not very, unfortunately) and promised to take her to the store for real the next day if the street's still unplowed. The next day I am waiting for her to call me about going to the store together and my cousin calls wanting Alzheimer's Aunt dug out and driven around. Of course everyone has a million reasons why they can't do it and I have to. I was pretty angry; I said "I've got my own mom to deal with, her street isn't plowed and neither is the street that's attached to." So then I had BOTH of them in the car. And later my mom complained how bad Alzheimer's Aunt STUNK. She REEKED. It's her breath, like death, like a dead animal under the porch in the summer, combined with an unwashed body and dirty clothing. "I tried to go outside and I fell down." I just clamped my mouth shut. When there's almost 4 feet of snow, it doesn't make you fall down. It holds you up. "I couldn't get up, I laid in the snow for 15 minutes." I just don't believe her. I don't believe she even went outside. "No one came and shoveled my sidewalk." Finally I spoke. "Who did you think would come when every road in the state was closed?" "I thought my neighbors would do it." "Did you ask them for help?" "Then why did you think they would shovel for you?" "They would see that I didn't shovel." Well, for all they knew, you weren't even HOME. And I bet if she had gone outside and made the slightest effort and others were outside shoveling, someone might have come over and asked if she needed help. Sitting in the house, no doubt with the stuck-out lip face, pouting, isn't how you get your walk shoveled. I announce, rather loudly and passive-aggressively, that I need gas for my car. So I have to shovel you out and drive you around but you can't pitch in for gas money?! The next day, I was talking to my cousin about her. I learned that Alzheimer's Aunt has spent approximately $6,000 in the last few months that can't be accounted for. Part of it may be her house taxes, but even if she paid the whole year, that wouldn't be that much money. I said, "Do you have power of attorney? It's simple. Invoke it. Take her checkbook, take all her credit cards. Call QVC and cancel her account. Have new credit cards issued so any cards she has saved online (like at Amazon) won't work. Go to the bank and say that she cannot take money out of her accounts anymore or get any loans. Give her $200 cash for groceries and nothing else." Then my cousin said that Alzheimer's Aunt has been going to her bank and opening $5,000 lines of credit like they are free money. She has a mortgage on the house (she's lived in it for over 40 years) too, we don't know for how much or what she spent that money on. But no one wants to invoke the PoA and "deal with all that" so they will let her spend herself into the ground. I suggested (I know I'm not supposed to suggest) that it's time she move into senior housing. "No, it would cost more." I did the math and I think it would be significantly less. The mortgage payment is about what rent would be. She would no longer have to pay house taxes, water/sewer, oil, gas, or electric. How would it cost more? Oh, but she can't live in a simple 1 bedroom senior apartment because she's got a 3 bedroom house hoarded to the brim with stuff she won't give up. Is she going to the doctor anytime soon? Getting tests? Anyone care what's really wrong with her expect me, the person she cares about the least? Also, in an aside, 1 year ago today my grandma had her (final) stroke and we pulled the plug. I will write about her later. I have a quick question for you regarding your blog, but I couldn't find your contact information. Do you think you could send me an email whenever you get a chance?